What’s That Big Box In The Basement? 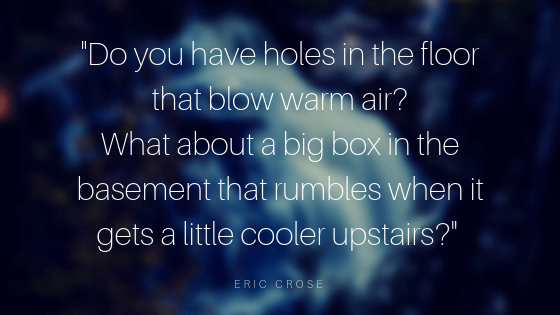 Do you have holes in the floor that blow warm air? A big box in the basement that rumbles when it gets a little cooler upstairs? The big box is your furnace, the holes in the floor are your registers, and you have forced air heat. Your thermostat on the wall is set to a specific temperature. As your house cools, the temperature drops below the setpoint. The thermostat is like a switch, like a light switch, but instead of you turning it on or off, it is controlled by the temperature and switches on as the temperature in the house drops. The furnace starts and heat starts being produced. The way it is produced depends on the type of fuel it uses (natural gas, propane, oil, or electric). Most furnaces allow themselves to heat up before the fan starts to distribute the heat, but as the furnace heats up, the distribution fan starts to distribute the heat through sheet metal ducts and up through your registers. Do You Have Natural Gas or Propane? The difference between the two is the orifice sizes feeding the burners and the pressure of the gas both before the gas valve and before it enters the orifices. The orifices are small holes that meter or restrict the gas before it enters the burners. Natural gas pressures are roughly 6-7 inches water column before the gas valve and 3.5 inches water column after the gas valve for a single stage furnace. Propane pressures are roughly 10-11 inches water column before the gas valve and 10 inches water column after the gas valve before going through the orifices. These values are listed on the furnace rating plate. The rating plate is an important part of your furnace for information. It will have the name of the furnace manufacturer, model, and serial number of the furnace, The maximum input of the furnace in BTUH (British Thermal Units per Hour), the type of gas the furnace is set for, maximum and minimum inlet pressures (before the gas valve), the manifold pressure (after the gas valve), and the symbol for the certification organization such as CSA. What Does “High Efficiency” Mean? Most furnaces these days classify as “High Efficiency”. This means that it is 90% efficient at a minimum. Efficiency can be as high as 98% in the higher end furnaces. What that means is under laboratory conditions, 98% (or whatever efficiency the furnace is) of the specific heat of the fuel is used to heat your home. For example, 1 cubic foot of natural gas under ideal conditions provides 1000 BTUH of heat (British Thermal Units per Hour). This is a standard measure of heat – more on that later. A 98% percent efficient furnace will use 980 BTUH go heat your home with the other 20 BTUH going outside with the exhaust. Because the furnace is removing 90% plus of the heat, the temperature of the exhaust drops low enough that the water vapour condenses. Water vapour is one of the products of combustion from the burning of fossil fuel and the high efficient furnace has to get rid of that water somewhere. 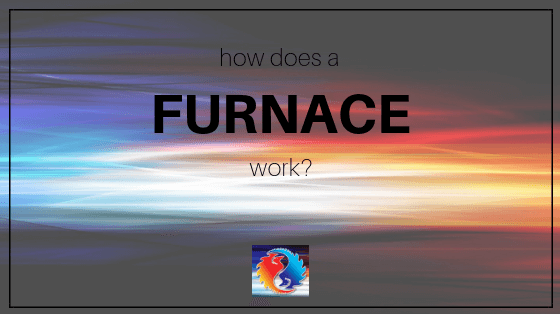 How Does A High-Efficiency Furnace Work? A high-efficiency furnace is set up with a drainage system as part of its construction. Then it is up to the furnace installer to determine how to get it from the furnace to somewhere that it won’t cause damage, such as a sump orPVCc drain. Condensate back up is probably the most common source of problems with the modern furnace. Any error code will have something to do with the pressure switch. The pressure switch or switches on a high efficient furnace is a means to ensure the free flow of exhaust products from the burner, through the primary heat exchanger, through the secondary heat exchanger (the part of the passage where the exhaust heat is mostly extracted to produce the condensate), through the induced draft blower-exhaust blower-“ventor” (which helps draw the exhaust through the furnace and push it outside), and out the exhaust pipe termination. The pressure switch error code will flash if any part of the exhaust circuit is blocked, broken, or flow is interfered with. Condensate back up interferes with, or blocks, the free flow of the exhaust. A dead exhaust blower motor stops the flow, causing a pressure switch error. Ask your furnace tech to show you how to flush the condensate drainage system for your furnace in a safe and efficient way. How Do I Fix The Flame Sensor or Flame Rod? Another common issue is the flame sensor or flame rod. This senses that the flame has successfully lit all of the burners. The sensor, over time, will get an oxide coating on it making it difficult to sense the flame. These should be cleaned by a professional because of their location sometimes. Ask your furnace guy about it. The thermostat is set for your favourite temperature, say 22 degrees Celsius, but the room temperature has fallen to 20 degrees Celsius. This is termed “a call for heat”. On a call for heat, the induced draft blower or “ventor” fan starts to purge any combustible gases or exhaust from the combustion chamber and heat exchanger, clearing the chamber for the next firing cycle. After 15 – 20 seconds of running, and the pressure switches made ensuring the exhaust system is in good order, the ignition system begins. The ignitor, close to the burner outlets will usually start to glow brightly, similar to an electric range. I say usually because there are also spark ignition furnaces still in use. The timing is the same but instead of a glow, it will spark rapidly. When the ignitor is glowing brightly, the gas valve will open with an audible click, allowing gas into the burners. The ignitor is usually positioned at one end of the burner train where it will light the 1st burner, then the gas will spread across to the other burners where it is sensed by the flame sensor on the last burner ensuring all burners are lit. On new furnaces, the circulating blower is controlled by an integrated timer in the control board, instead of by the heat of the furnace. The timing of the circulating blower usually has limited adjustment through dipswitches or jumpers on the control board. The burners will continue to heat the furnace and the circulating pump moves the warm air over the heat exchanger and up to the living area until the room temperature matches the thermostat set point. High efficient furnaces also have a control board that have error or fault indicator lights on them. These “idiot lights” help diagnose problems with the furnace. 1) Low batteries in the thermostat. Is your thermostat display digital? Then it uses batteries. Some thermostats will tell you that batteries are getting low, but many will not. And even if the digital display is still good, the batteries may be too weak to operate the furnace properly. Action: Pick a day, once per year, to change the batteries in your thermostat AND your smoke detectors. 2) A dirty air filter restricts the flow of air through the furnace. The circulating air is supposed to flow through the furnace, around the heat exchanger to absorb heat from the combustion process. If the air cannot flow or is restricted, it can only remove a limited amount of heat leaving too much heat in the furnace. Overheated heat exchangers will eventually crack. The high exhaust temperatures are very hard on the exhaust fan. The furnace will cycle on the high limit safety rather than the thermostat putting a strain on that. 3) Modern High efficient furnaces exhaust the flue products through specially approved S636 PVC vents, usually through the side wall of your house. There could be only one exhaust vent or 2 vents, one being exhaust and the other being a combustion air intake. Older high efficient furnaces used black ABS piping. A common winter problem is snow and ice building up around and in the vents. During snowy evenings or especially cold evenings, brush the snow away from the vent terminations, AND ensure snow has not built up inside. Action: Brush away the snow from around the vents. Look into both vents for blockage. Use a wire if you can to get inside. 4) Another common problem with high-efficiency furnaces is a dirty flame rod (sensor). Symptom: The furnace will go to prepurge and the ignitor will glow. The valve will open and the burner will light, BUT only for 2-3 seconds. At which time, the burner will go out. The exhaust fan will continue to run. The furnace will attempt to run several times until it gives up and locks itself out. Action: Call a qualified gas furnace technician. Crose Mechanical offers the areas of Owen Sound and Grey Bruce furnace services and products.